Each week here on the Gish Bar Times, we profile one of Io's 400 active volcanoes as part of our volcano of the week series. This week, we take a look at fairly dormant Shamshu Patera, a large patera, or volcanic depression, on Io's leading hemisphere. If you haven't read it already, be sure to check out last week's volcano of the week, Tvashtar, which we covered in great depth over three articles (Part One - Part Two - Part Three). As always, let's take care of the basics first about this volcano. Shamshu Patera is located at 10.1° South Latitude, 63.0° West Longitude, or about 500 kilometers (310 miles) ESE of Hi'iaka Patera, a volcano of the week back in August. The volcano measures 115 kilometers (72 miles) north-to-south and 107 kilometers (67 miles) east-to-west. The height of the patera wall which marks the outer edge of the volcano is variable as the surrounding terrain is not constant, the result of debris flows coming off a mountain that abuts the northeastern margin of Shamshu Patera. Shadow measurements along the northwestern wall of Shamshu show that it is 500 meters (1,640 feet) tall, however the lack of a shadow along portions of its western wall suggest that it maybe less than 50 meters (160 feet) tall in some areas. 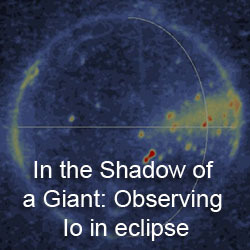 Shamshu Patera was named at the IAU General Assembly in August 1997 after a pre-Islamic Arabian sun goddess. 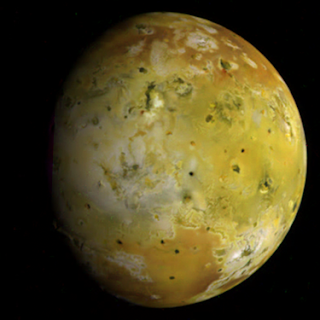 Galileo's best images of Shamshu were taken on February 22, 2000 during its I27 encounter with Io. I have reprojected the two images that covered Shamshu Patera into a two-frame mosaic, in a simple cylindrical projection with a scale of 350 meters (1,150 feet) per pixel. 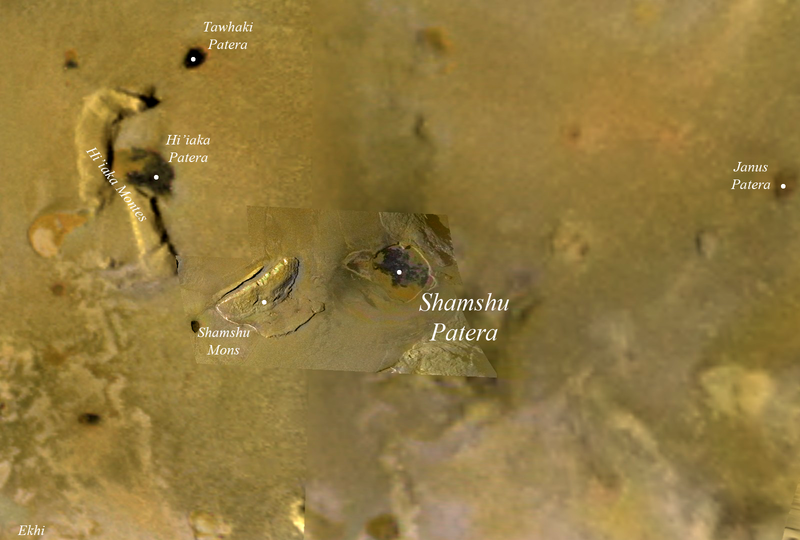 This mosaic covers all of Shamshu Patera, right of center, as well as Shamshu Mons to the west and portions of two other mountains: one abutting Shamshu Patera to its northeast and another a little farther away to the southeast. For a look of color in this region, see the map above as well as a global view from June 1997. A few obvious features stand out about Shamshu Patera. The volcano's floor is dominated by dark lava flows of varying albedos. 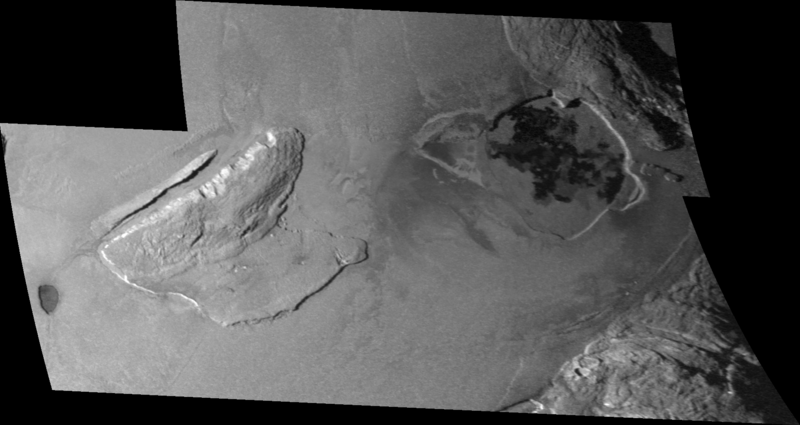 The different levels of brightness of its flows suggest that different eruptions produced new flow lobes that covered a different potion of its floor. As the lava flows age, they cool and all more sulfur dioxide and sulfur to condense on their surfaces. So as they age, the lava flows slowly brighten. 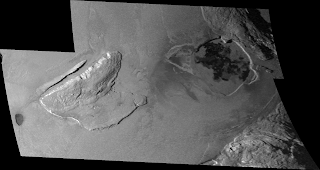 Despite how dark many of these lava flow lobes look, I can't see any evidence for surface changes at Shamshu during the Galileo mission, so either very little SO2 is deposited here, or they maybe persistently active. More on that in a bit. 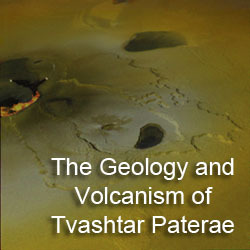 The shape of Shamshu's dark material, and the more central location in the patera, is more consistent with these resulting from lava flows rather than this volcano being a lava lake, like Pele or Loki. About half of the patera of covered in material that has the same brightness as the surrounding Ionian plains and has a brighter orange color. These areas likely haven't seen lava flows in recent times (> 100 years) or may have been coated in sulfur. Just outside of the Shamshu's walls, a number of apparent bright flows are visible. To the west of Shamshu, these bright deposits are correlated with the margins of the debris flow that came off the mountain to the northeast of the volcano. That's right, I said margins, because layers are apparent within the edge of the debris flow. The visibility of layers combined with the presence of bright material correlated with the scarps that mark the edge of these layers suggest that they are eroded by sulfur dioxide sapping. The presence of layers in the debris flow (if that's what this is) would also mean that the landslide materials are remarkably well sorted with a mix of basalt/sulfur and sulfur dioxide layers. A very bright flow is visible along the southern edge of Shamshu Patera, either the result of a sulfur flow, or, more likely, a silicate lava flow whose surface has been chemically altered. Something odd is going on here because this flow is quite bright, so bright that from distant imaging, it almost looks like it should be the southern margin of Shamshu Patera. As far as current volcanic activity, Shamshu was observed by the Galileo Near-Infrared Mapping Spectrometer (NIMS) as an active hotspot on only one occasion, during orbit C10 in September 1997. The region was observed on several occasions before and since by Galileo and by New Horizons in 2007 and no additional activity was detected. 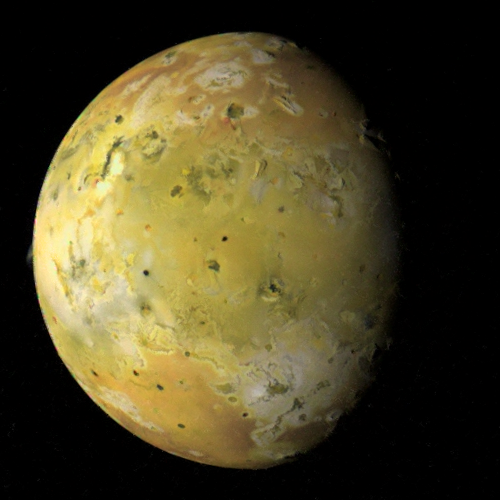 Next week, we will shift our focus from this fairly quiescent (at least in the present epoch) volcano to the more active Isum Patera on the opposite side of Io. Bunte, M.; et al. (2010). 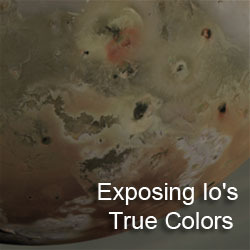 "Geologic mapping of the Hi’iaka and Shamshu regions of Io". Icarus 207: 868–886.